Before Schumann wrote this piano quintet, Schubert and Hummel composed piano quintets for Violin, Viola, Cello, Contrabass and Piano. Those quintets would be written for salon music. After Schumann’s success on this new Piano Quintet by string quartet + piano, many composers found the high potential of this new style. Major works by this style were written by Brahms, Dvorak, Franck, and Faure. When Robert and Clara Schumann visited Bremen and Ortenburg in February, 1842 for their concert tour. Throughout the tour it was not unbearable for Robert that Clara was always highly applauded but he was not so much. He was uncomfortable with the situation and decided to part with Clara and returned Leipzig alone on March 12. Then he had fallen into a deep depression until Clara came back on April 24. Also there was a rumor that Wiek Schumann, Clara’s father had been trying to separate them.During this time he had drowned in beer and champagne, but he also studied ardently counterpoints and string quartets of the classic era. When Clara came back home, Robert became very happy and he started the year of chamber music. He composed 3 string quartets, Piano Quintet Op.44, and Piano Quartet in 1942. Piano Quintet Op.44 was worked from September 23, 1842 and completed on October 12. The core of this Piano Quintet is a funeral march in the 2nd movement. I guess the march would be conceived in March or April 1842 when he was deeply depressed. Whose funeral, Robert himself or Clara? Anyway,he apparently had a special thoughts on this funeral march, and developed this theme into the great piano quintet later. The combination of string quartet and piano seems natural for Robert as he finished 3 string quartets right before the quintet. The second movement theme is gloomy and depressed, however, the Quintet as a whole has quite positive and brilliant since this was written when he felt nasty problems had all gone. You will find Schumann's characters of Florestan and Eusebius. For instance, 1st Theme of 1st movement is of Florestan and seems to express the joy of recovery when they meet again, and 2nd theme is Eusebius using the phrase derived from the main theme of 2nd movement. 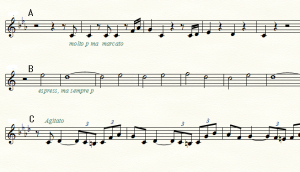 Below is some samples how Schumann develops the whole 4 movements from the main theme of 2nd movement. Second theme of the first movement, Trio I and Trio II of the third movement and first theme of 4th movement are developed from the theme. Agitato  is a variation of Main thema. Main theme( below left) c-f-g-c , first c is tranposed up by an octave and whole phrase is transposed in ges-dur. Main theme( below upper) c-f-g-c , g is tranposed down by an octave and whole phrase is transposed in ces-dur and deformed by ornaments.Schumann put accent marks on key notes. Main theme( below left) c-f-as-g-c , first c is tranposed up by octave and whole phrase is transposed in Es-dur. There are many more in the work but I will leave them for raders to find. The below passage plays important role in 1st ,2nd and 3rd movements.